I'd been distributing Jon's records for years by the time we both got onto a stage together. This was in 1989 In Rotterdam, where we played in a trio with Phil Minton. After that there was a quintet in Berlin with Jon, Shelley Hirsch, Connie and Matthias Bauer- which led to a trio tour with Shelly, including a memorable 6 hour delay in the snow and on freezing platforms trying to get to Ljubljana. (We finally arrived after the concert would have been over and were driven instead to a radio station where we did the concert anyway, live to air. Flexible country). We got a concert of the year award from the Desi, in Nurenberg. A more out of hand trio tour followed, with Eugene Chadbourne (it takes at least two grown men to hold him down), this was the infamous Cultural Terrorism tour. Even after this, Jon invited me to join his shopping group in Dresden for a concert in a vast echoing museum gallery. The acoustics were not drum friendly and for the first time I set up only the electronics and a table full of clutter. It was also the first time I met Otomo Yoshihide and Marie Goyette, whom I later invited to be in p53. Over the next years we shopped in Malls (with a couple of dozen violin students playing on escalators), at many festivals (Otomo was so involved in destroying a wall of cartons he cracked a bone in his arm at Victoriaville) and in smaller manifestations elsewhere. Between and since there was Jon's vast techno extravaganza at Wels, a trio with Fred Frith in Buenos Aries, and Roberto Musci's film accompaniment project in Milan (ReR RMVC). We finally did a duo together in London in 2000. When I had the chance, thanks to conductor Ilan Volkov, to do an orchestral version of p53, I invited Jon and Zeena Parkins to join me as soloists. Since he moved back to Australia, encounters are slightly less frequent, but we manage, most recently in Nimmersatt, a take no prisoners quartet with John Greaves and Daan Vandewalle. I've been pleased to release 7 of Jon's CD's on ReR so far and to contribute texts for a couple of his books and radio pieces. Soundstages in San Francisco and Los Angeles were being structurally reinforced yesterday in preparation for the arrival of Tom Dimuzio and Chris Cutler in September. Said Fire chief Don Draper ‘From the day Dimuzio moved out here it’s been one disaster after another - now he’s bringing that Brit nutcase over. For what ?’. Well, according to Press releases, the ill-matched duo are coming in a cynical attempt to puff up their new CD ‘Quake’, recorded at earlier shows on the East Coast this spring. ‘They don’t seem to care how much damage they do in the process’ said one beleaguered club owner ‘but we gotta have them or their fans will tear the place down’. ‘I used to like Chris Cutler,’ he added,’ but now he’s just fooling about with his so-called ‘electrified’ kit; I mean piezos and pedals and spaghetti’s of cable like he’s a guitar player or something. And his ears are gone. Dimuzio’s been deaf for years. Dimuzio, I ask you, what’s that ? Live sampling, processing – it’s just an excuse for making everything sound like the last crack of doom. You might as well try to sleep on the runway at SF International. And he’s got that rig of his connected to the room, to Cutler’s kit, and running through his seismic generators’. ‘Plain irresponsible’ said the LA Times, ‘shapeless noise’ commented Markus Fox at the Herald Trib. ‘this writer sure has no problem believing they make it up as they go along’. But a million fans don’t care. At least if dozens of news groups are to be believed. I also invited Tom as one of two soloists (the other was Daan Vandewalle) for a recent performance of p53 for Orchestra at the Angelica Festival in Bologna. The rest: the instrumentation was crucial: two grand pianos, turntables, electronics and real time processing. I asked Marie Goyette, whom I had met playing in one of Jon Rose's shopping projects and Zygmunt Krause (Polish composer and virtuoso pianist) to handle the pianos, restricting Marie to a selection of late C19 and early C20 classical repertoire fragments. Then I asked Otomo Yoshihide to do what he, famously, did and Lutz Glandien. German Composer and former performer both to play and to do real time processing of the other players. The composition was, more than anything, the people. Hessischer Rundfunk who commissioned it, has video of the entire concert, which they broadcast a few times. Otherwise, the ensemble performed twice, at Frankfurt and again three years later at the Angelica Festival in Bologna. In 2006 Conductor Ilan Volkov asked if I had any orchestra pieces I'd like to propose since he had an orchestra and was running an adventurous programme with it in Glasgow. I suggested a version of p53, with the orchestra acting effectively as a kind of giant acoustic sampler. Jon Rose, Zeena Parkins and I were the three other soloists. Two other versions have been performed to date - one for a chamber ensemble and soloists (Tim Hodgkinson, Maya Dunietz and myself), in Tel Aviv, and one with Orchestra of the Opera House of Bologna (with soloists Tom Dimuzio and Daan Vandewalle). Here's the score to the solo version I wrote for Ilan. It explains the role of the orchestra in other versions. So far it has not been performed alone. Select between 17 and 20 short extracts from the orchestral repertoire. Prepare or arrange for the preparation of part scores for all players in a format easy for them to access quickly (and if possible quietly). Designate a sign system to indicate which players shall play which pieces and at which tempo - with additional signs for starting, stopping, caesura, repetition (looping), accelerando, decelerando, crescendo or decrescendo - as a group, without conductor’s supervision. Included: a general loop sign will indicate that the orchestra is to repeat an entire extract, a special loop sign will indicate specific start and return points in real time – the orchestra will then repeat this extract (including any accelerando, decelerando, crescendo or decrescendo instruction) until stopped or released from the loop - when they will continue with the score, as written. A meta sign will indicate that an instruction given is to apply to the entire orchestra irrespective of which pieces they are playing at the time. A release sign will release any section, sections or individual from the general instruction. Conductor may indicate to the whole or any part of the orchestra, down to an individual player, which score to play from and at what tempo, adding any of the other autonomous sign instructions above (which can also be indicated at any time during the performance of any extract). Once started, players will take introductory tempo as absolute and will not expect further tempo indications from conductor. Nevertheless, sections of, and the whole, orchestra will continue to respond to direct indications from conductor as to dynamic level, tempo adjustments, caesura &c. as well as the range of special signs established above. Meta signs will apply to the whole orchestra irrespective of which extract they are playing, except any who are also given a release sign. Any player not sure what to do will stop playing until asked to do something they do understand. Players reaching the end of their extract with no further instruction will stop. The performance is to build in real time from the individual expression, juxtaposition, superimposition, layering and bringing in and out of selected extracts at designated tempi. Introductory tempi will always be assumed to be absolute unless changed by the conductor, and once started players will not expect constant reinforcement. Like organ keys, once pressed, they must sound until released. The number of possible individual polyphonic elements is limited only by the size of the orchestra. The composer may introduce cadenzas in the form of blocks determined by his own signs prepared with the orchestra that specify some action not included above. I met Steven in Novi Sad, Jugoslavia (I was touring with The Black Sheep. There was a concert in a local sculptor's garden, I remember, where Stevan played with us. After that, it was a while before I heard from him again. That was when ReR started to import and distribute his records. A little later, he did a piece for one of the Quarterlies; then we released a CD of his. By this time he was living in France - after studying in Holland - and working with choreographer Josef Nadj. In 1996 he invited me to work with him on the music for one of Josef's productions, L'Anatomie du Fauve. We did this for 3 years, on and off and in the meantime recorded music for another choreographic production for circus performers, Cri du Cameleon. 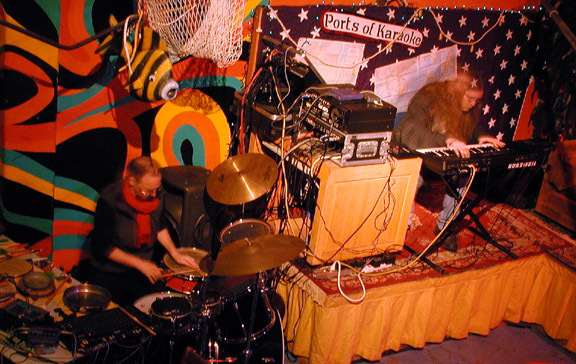 We also performed as a trio with the extraordinary composer and instrument designer Erno Kiraly at Ring Ring in Belgrade, 1996. The same year, I asked him if he'd like to do a song record and gave him some texts. This became 'a mere coincidence' (ReR Science) by The Science Group (Stevan, Myself and Bob Drake, with guests Fred Frith, Amy Denio and Claudio Puntin). And in January 2000 we premiered our music-theatre piece Le Signe de Trois at the Sons D'Hiver festival in Paris, with Marie Goyette, Eric Houzelot and Christian Germain.vA second Science Group record followed in 2004. Track on RING RING '96, with Erno Kiraly. Founded by Massimo Simonini and Tiziano Popoli in Bologna, N.O.R.M.A. is a large ensemble that performs through-composed pieces, sometimes deconstructed from other works (Hermann's Psycho, Satie's Cinema for instance). Massimo, in passing, is also the imagination, energy and co-organiser of the substantial Angelica Festival in Bologna; consistently one of the best festivals of our kind of music in the world (in fact virtually all such festivals are European - Victoriaville in Canada being a notable exception). Early pieces by NORMA appeared on the ReR Quarterly and later we distributed their first CD. In 1995, Massimo invited Phil Minton and myself to augment the group for their Angelica Festival appearance, and out of this came my longer association with NORMA, including the recording of the CD L'Arpa e L'Asino and a number of concert performances in Italy, Greece and the UK. With Tiziano Popoli I later worked on a radio piece for RAI 3. Massimo and I have also performed as a duo. In practice, I calculated and recorded 4 one hour sequences of clicks, constantly changing and based on Cowell's ratio theories (including some Bartok transcriptions, taking pitch as pulse) so that, in theory, complex and precisely calculated 'rhythm-chords', would be created. In other sections there were accelerandos and decelerandos co-ordinated in humanly unplayable ways - and so on. It sounds simple enough, but it took sophisticated software, the help of Stevan Tickmayer and 4 days solid work to calculate and programme this stuff. On another 4 tracks I put cues indicating 'one bar before a stop' and 'one bar before an entry' at the appropriate tempi. On stage, each musician had an in-ear monitor to deliver their personal their clicks and cues. So, while the structure was thus totally constrained, the content was still left entirely to the performers. Their unreasonable task was to obey the start, stop and tempi rules and at the same time try to make the best musical decisions taking into account, but not falling into step with, what the others were playing. I needed Rolls Royce improvisers for this work, and improvisers who also possessed an enhanced sense of compositional organisation. So I asked John Tilbury, Fred Frith and Frank Schulte. The piece has been performed only at its premiere. This Romanian contemporary music ensemble is the main instrument of composers Iancu Dumitrescu and Ana Maria Avram. I first heard Iancu's music on Romanian Elektrocord and the American POGUS labels in the early '80's, and a little later Editions RZ in Germany released another. We distributed these until, in the early 1990's, Iancu and Ana Maria founded their own label, Editions Modern, for which ReR became a major distributor. In 1998, after a lot of correspondence, Tim Hodgkinson and I were invited to collaborate with the Ensemble for a project at Musique Action in Nancy. We rehearsed mostly in Iancu's house, without real instruments (I use large scale classical percussion in this context and, occasionally electronics) until we finally got to set up properly at Nancy. Tim and I had both prepared pieces for the ensemble too (these, plus one each of Iancu's and Ana Maria's, appear on ReR DACH1). Later the same year we premiered new works of Iancu and Ana Maria's for Romanian Radio. Since then Tim and I have done many concerts, tours, festivals with the Hyperion and Hyperion International (an ensemble of mixed nationalities, sometimes conducted by Ilan Volkov) as well as a sextet with Iancu and Ana-Maria plus harpist Rhodri Davis and Elio Martescielo in 2005, and a as a quartet at Jean-Heve Peron's Avantgarde Festival in 2008.